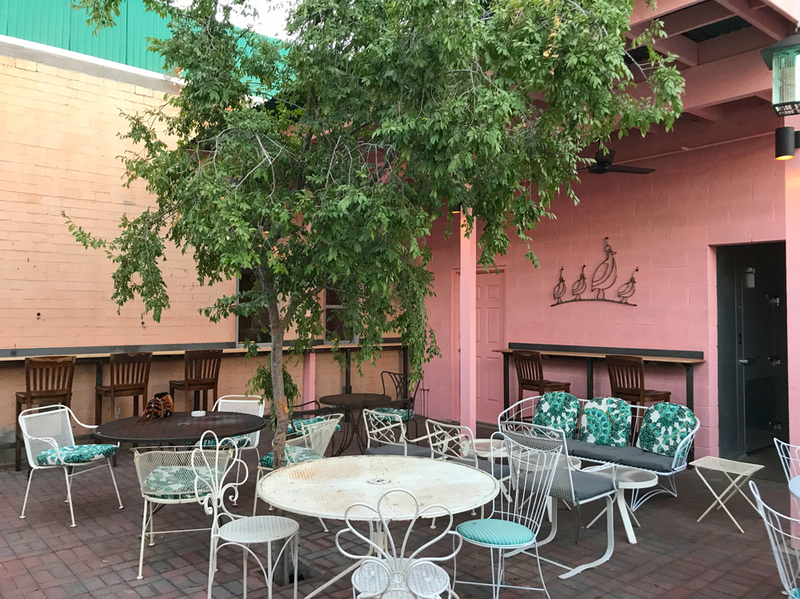 Gracie's Tax Bar Fills Old Downtown Building with Cheap Drinks, Vintage Vibes - Downtown Phoenix Inc.
“I’m Grace. 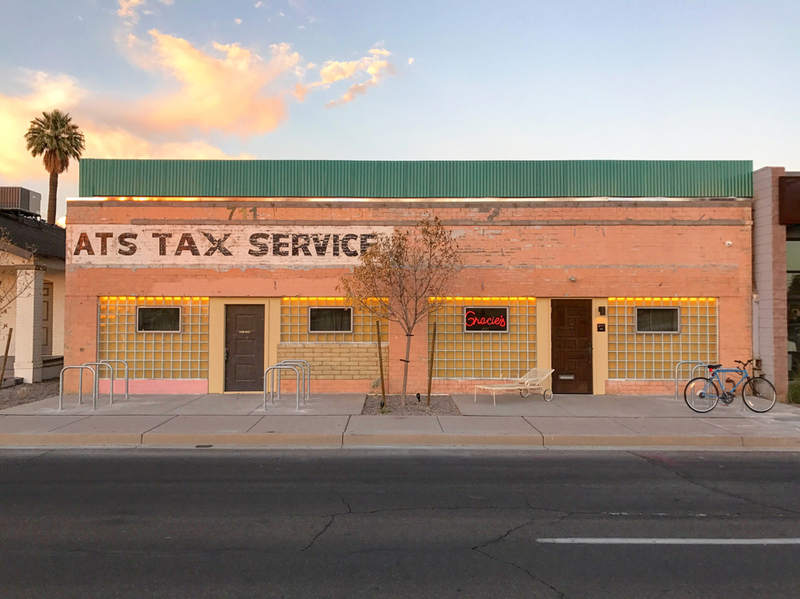 This is an old tax service from the 1970s,” said Grace Perry, owner of Gracie’s Tax Bar on Seventh Avenue and McKinley Street. Her explanation behind the establishment’s name, which opened July 8, mirrors the no-nonsense vibe of the bar itself. Cheap drinks ($3.75 wells), a vintage vibe, along with tasty food options make for a simple, yet promising combination. Food is served late with your choice of five things: chopped cheese, vegetarian chopped cheese, tater tots, onion rings and fried pickles. For those unfamiliar with the East Coast staple, a chopped cheese (also called chop cheese) consists of ground beef, onions, melted cheese, lettuce, tomatoes and condiments on a hero roll. Basically, this is the gold standard in drunk food. While resisting the urge to label Gracie’s a dive bar — because that’s a term that’s “earned over the course of 30 years” — Perry said she wants it to be a relaxed neighborhood hangout. The red lighting, vintage furnishings and funky artwork helps cozy up the place, harnessing some of the feels of yesteryear. Minus the old beer smell. A large L-shaped bar lines one side of the room with a row of second-hand booths on the other. An assortment of vinyl chairs and barstools round up the eclectic mix of seating options. It’s the type of place you’ll want to bring friends, pull up a chair and stay awhile. Maybe even strike up a game of Monopoly – among other board game options – over a pitcher of Miller High Life. “No craft cocktails,” Perry said. That’s not what Gracie’s is about. Not in a snobbish or hipster way – just in the sense that downtown already has craft cocktails, specialty bars and upscale restaurants. “I consider myself a Phoenix downtown local,” she said. “I’ve lived in the neighborhood, and I think this is what it’s lacking,” she said. 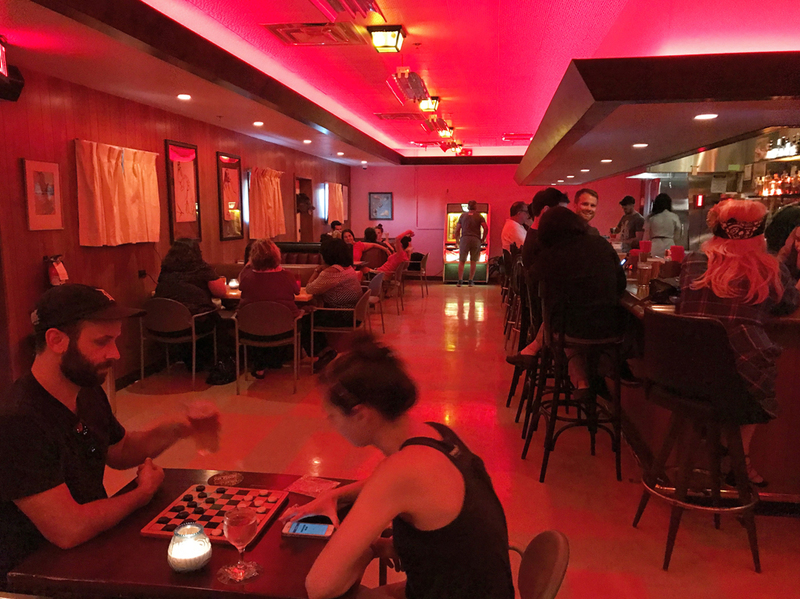 The small 50-person capacity makes the bar feel intimate, but it’s designed in a way that doesn’t feel crowded. For cooler weather days, a patio filled with midcentury “grandma lawn furniture” completes the comfy, casual space. From the Formica tables to the taxidermy javalina head hanging on the wall, the interior feels dive-y and charming in the best possible way. Some investors helped with the startup costs of opening, but the concept is all Perry. She handpicked many of the items including the pen-and-ink sketches on the wall and every single CD in the jukebox. In her younger days, she spent time playing in a band before transitioning into the restaurant and bar industry. After working for the restaurant group Upward Projects, she managed Crescent Ballroom and Valley Bar for six years. “This world has always fit my personality,” she said. After dreaming of having her own place one day, she decided to save all her pennies and open Gracie’s — a project several years in the making. Gracie’s Tax Bar is now open every day from 4 p.m. to 2 a.m. with tentative plans for weekend brunch and some special events in the fall.